So you thought you had a rough week? Try being a Major League Baseball umpire. 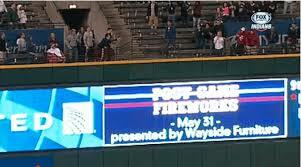 This week shone a giant light on the element of human error in the umpires and put more emphasis on instant replay. Let’s start with what went on in Cleveland Wednesday night. Adam Rosales of Oakland stepped to the plate against Cleveland’s Chris Perez with Cleveland leading 4-3. Rosales hit a blast to left center field and it looked like it hit off the railing in the seats and bounced back onto the field. The umpires called it a double, claiming it hit the wall. 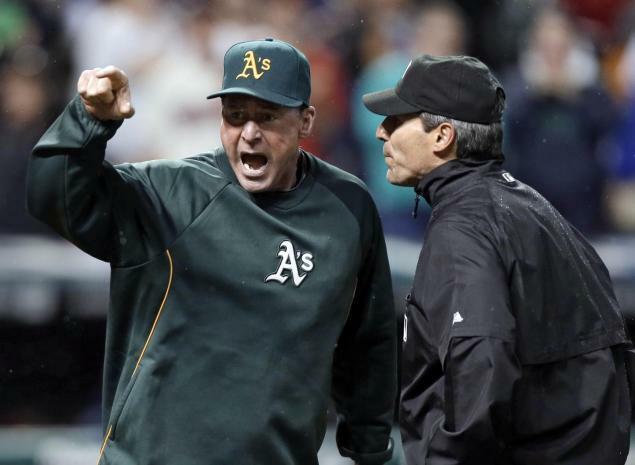 Oakland A’s manager Bob Melvin came out to dispute the call, and the umpires reconvened to look at instant replay. After viewing the video(which was blatantly a home run)the umpires came back and the double held up. Melvin was infuriated and rightfully so, as the umpires have more than one angle they can look at the play from and have more than one feed for it as well, with both the Oakland and Cleveland broadcasts available. 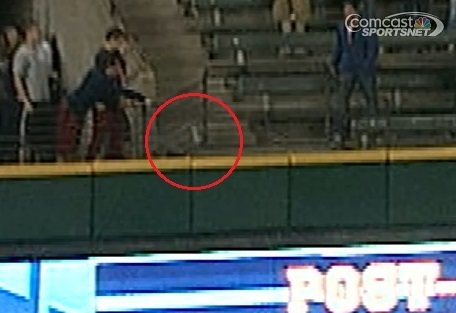 Somehow, the umpires still felt the ball hit below the top of the wall. Melvin was eventually ejected from the game and Oakland would lose by that 4-3 score. Major League Baseball declared the next day that it was an improper call made by Crew Chief Angel Hernandez, but the call would stand. But the story doesn’t end there. 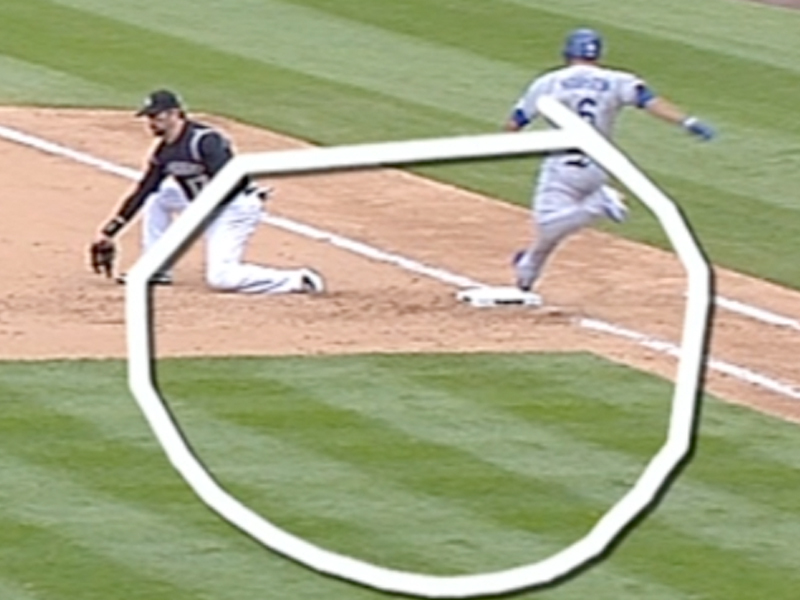 How can you screw up instant replay, especially when it seemed so obvious what the call should have been? Peter Gammons seems to think this was done on purpose as an objection to instant replay. Make sure you click and read that column. WOW! Now, Gammons doesn’t ever just throw out accusations like that, as it just isn’t his style. So for him to go out in a public forum and say that must mean there is a lot of validity behind that statement. So some of the umpires don’t want instant replay? I’m not shocked, but in the end we will get more instant replay. But Hernandez’s gaffe wouldn’t be the only one by an umpire this week. 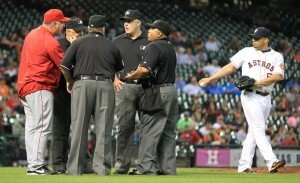 During Thursday’s Angels/Astros match up, Houston manager Bo Porter decided to make a pitching change in the 7th inning. He brought in reliever Wesley Wright, while Angels manager Mike Scioscia decided to use a pinch hitter to combat Wright coming in. Porter then called for another reliever to counteract Scioscia’s move, bringing in Hector Ambriz. The problem is by major league baseball rules that is a no-no. Rule 3.05b says: “If the pitcher is replaced, the substitute pitcher shall pitch to the batter then at bat, or any substitute batter, until such batter is put out or reaches first base, or until the offensive team is put out, unless the substitute pitcher sustains injury or illness which, in the umpire-in-chief’s judgment, incapacitates him for further play as a pitcher.” To make a tad bit simpler, if you bring a pitcher into the game, he has to pitch to at least one batter before you can take him out and put in a new pitcher. This was, of course, Scioscia’s argument and led to a long heated debate between himself and the umpires. There is normally a four man umpiring crew, yet all four men in blue believed Porter could bring in another pitcher without Wright pitching to a batter. Think about that for a bit. The four guys who are in the game to uphold the rules didn’t know what the actual longstanding rule was! 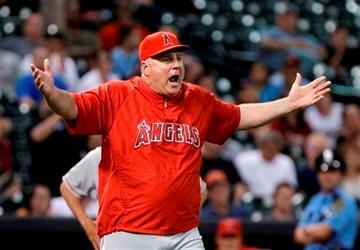 Scioscia would then protest the game, as it continued and eventually the Angels would win in spite of this entire mess. Major League Baseball reacted fast again, suspending Crew Chief Fieldin Culbreth for two games and fining Adrian Johnson, Brian O’Nora and Bill Welke. This is almost uncharted territory, as very rarely do umpires get suspended, especially for just a missed call. Granted, this was no normal missed call. But it does show that Major League Baseball is paying attention and realizes that umpires should be punished for their mistakes, just like players and coaches are. But the hot button topic that these two miscues seemed to have elicited is instant replay. Instant replay has been maybe the most discussed topic in baseball circles for years now, yet we still see very little actually used during games. The most widely discussed argument is that the human element has been used for years and the percentage of mistakes an umpire actually make are few and far between. There is truth in that statement, but it ignores the main issue that keeps the topic from continually popping up: the actual mistakes. It seems odd that in 2013, with the technology that is available nowadays, that baseball still hasn’t adopted instant replay. When people at home can EASILY tell when a call is blown, it makes no sense to not use the technology out there and make sure the umpires get the call right. It’s as simple as putting a 5th umpire up in the press box and giving him a very short amount of time to look at the play and render a decision. Why it isn’t as easy as that is a completely different conversation. So why are we still waiting on Major League Baseball to adopt full blown instant replay? There are two factors. One, Allan H. Selig and the rest of the good ole boys that are the major league owners are very old-school and don’t want to change with the times. Look, I’m an open minded traditionalist when it comes to baseball, but just since Selig has been in office, baseball has added the wild card, started interleague play and added a bit of instant replay. So that reason shouldn’t fly. No, the real reason is money. It cost extra money for the equipment. It cost extra money for a 5th umpire. The NFL spends about $4 million a year on instant replay, while baseball has ten times the amount of games football does, it would knock that cost well into eight figures. But the sad part is baseball can afford it. Look at the recent TV deals. Baseball is swimming in money, so they have no excuse not to pony up the cash and equipment and make instant replay happen. It makes the sport look bad when everyone else can see what they choose to ignore. Unless somehow they get some sick pleasure from their umpires screwing up calls on a nightly basis. If that is the case, we might be waiting awhile.